Go out in the Midday sun…as the song goes. However it was so hot even the mad dogs had given up the ghost…which just left the Englishman. More dogs from the same spot this time with two lads in tow. Balder one of the three dogs a mate has .The Breed is caller Dunker also know as Norwegian Hound. Last weekend I went on a long walk with two mates and their dogs. I borrowed one of them to tow me around for most of the day. A fun experience for us both, I hope. I do miss having my own dog as growing up we always had one. Go Rhinos: Wonderland, a photo by Davidap2009 on Flickr. Go Rhinos : Mrs Hearty, a photo by Davidap2009 on Flickr. 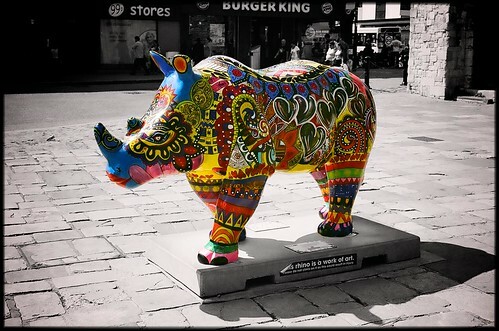 “Mrs Hearty’s” design was initially inspired by Minky’s artistry in painting Wessex Heartbeat’s little rhino, “Hearty”. 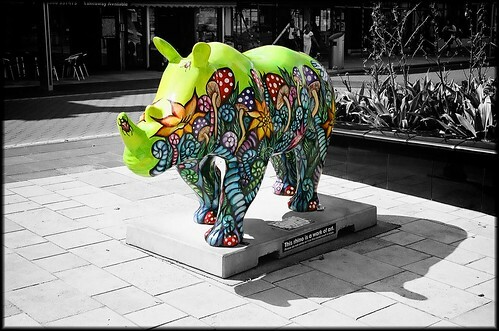 The student artists were keen to show synergy between the two rhinos, but also wanted to meld the colour and feel of the African origins of rhinoceros.